Chris Brennan, staff writer for the Philadelphia Enquirer, covered the discussion Tuesday at the University of Delaware that featured former Vice President Joe Biden and Republican Ohio Gov. John Kasich. Billed as “Bridging the Divides,” the event was promoted by “Kasich for America,” a PAC the governor used in his losing run for president in 2016, and hosted by the University of Delaware’s Biden Institutes’s School of Public Policy and Administration. Biden and Kasich spoke during the afternoon about a popular topic these days: How to bridge the partisan divide that has so split America in the era of Donald Trump. As Brennan reported, “both men lamented the Trump administration and the current culture in Washington,” adding that both agreed the level of partisan rancor is unacceptable. Brennan then wrote about an interesting meeting of the minds among them, that sheds some light on Kasich’s role in embracing partisan rancor more than two decades ago that have come to haunt the nation today. For history buffs who remember where Ohio U.S. Rep. John Kasich was in 1994, during the rise of Newt Gingrich to House speaker, and what he was doing, they remember Kasich was a Gingrich guy, an ambitious wing-man for the combative, argumentative Georgia congressman, whose great political marketing idea that contributed to dividing America along political fractures was formulating the Republican manifesto Kasich eagerly supported, “The Contract For America.” Republicans were elected to a majority of both houses of Congress for the first time since 1953 as a result. 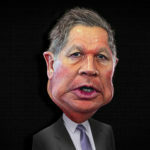 When Newt Gingrich did become speaker in 1994, Congressman John Kasich became a made man with his elevation to chairman of the House Budget Committee, a position Kasich has relied on since to assert his Washington insider bona fides. History buffs will also recall that Congressman Kasich was full steam ahead on impeaching Bill Clinton in 1998, so much so that he voted for all four charges brought against the president. The New York Times wrote in Feb. 1999 about Kasich’s vote to impeach Clinton. When the Times reporter asked Kasich how often in his political speeches he brings up his House vote to impeach Clinton, Kasich said hardly at all. Had this been a real debate instead of a forum featuring two nice guys agreeing about today’s unacceptable jagged political tones and rancor, or whether “America has lost it’s way,” as Kasich asked rhetorically, Joe Biden could have easily dismembered Kasich there on stage, like he did Paul Ryan in 2012, when the Wisconsin congressman and now House speaker was Mitt Romney’s running mate, by just taking Kasich on a trip down memory lane. Shape shifting isn’t a new tactic for Gov. Kasich when it’s politically advantageous to do so. In 2015, when he mounted his second run at the White House, he said he would never have taken the nation to war in Iraq like President George W. Bush did. Time and change will surely show that the role career politician and now national chaplain John Kasich played in the early days of the partisan rancor he now cries about will be remembered clearly by some, even though others may forget while Kasich pretends he wasn’t a part of it then and is all about bipartisanship now.